Since the inception of the saw trailer in 2004, God has kept the ministry moving and growing far beyond anything that was conceived. 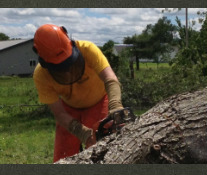 Not long after returning from working on the aftermath of Ivan, a generous donation from a Baptist men’s group allowed the purchase of a new 36” saw for the trailer. But God didn’t stop there. Since then two more 16” saws were added, along with another pole saw, two 28” saws, and two 14” trimming saws. Finally, thanks to another generous donation from Crader Industries, a 48” behemoth was added to the arsenal. Also, a small utility trailer joined the saw trailer to allow the crews to divide, and cover more area on the larger call outs…(more on this one later). The bobcat purchase was something that can only be attributed to God’s work. The idea had been talked about, but not as a “must have”. But out of the blue, there it was…a 753 Bobcat, in nice condition, at the right price. 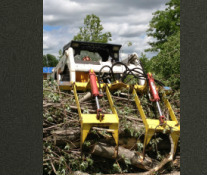 Soon it had it’s own trailer, and work was started on a customized grapple to pick up everything from sticks to logs. As the saw trailer, and the Bobcat were under development, so was an idea about attempting to make a shower/laundry unit to supplement the DR ministry. After literally months of prayer and planning a final design came to the surface, and work began with a custom trailer built especially for the project. It was another 7 months before it was ready for a shake down cruse to Miami, OK to aid the mud out crews working after the flood. And last, but not least of the trailers is the previously mentioned utility trailer. An idea came out that was a new approach to the Disaster Relief Ministry, and the little trailer found a new service to fill. 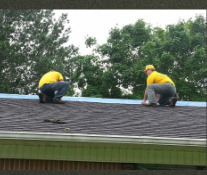 It is now equipped with various carpentry equipment, and chain saws to help cover roofs, do some tree clearing, window and door covering, and other temporary repairs to homes of storm victims. It is the first of it’s kind in the State….a “First Responder Unit”. As the name implies, it is designed to roll to a location with little or no notice, with a minimum complement of workers and start work as soon as possible. At some point during the growth of the DR trailers, it became more and more apparent that finding them a central home was more than just wishful thinking. The weather was taking it’s toll on the older units, and it was felt that taking care of the Lord’s equipment was just as important as using them to spread His message. Once more God saw fit to bless the ministry with a new 2000 square foot “barn” designed to fit all of the trailers inside, and out of the elements. With careful planning, it was nested on the Spring River Baptist Association property, just behind the Chaplin/Children’s Home offices. All of that being said, for all the wonderful blessings that God has given the DR ministry, it took more. It took support from the Association churches, and from individuals to help make it happen. It also takes individual determination to serve the Lord to keep the trailers rolling and serving as they were intended. The great thing about the DR ministry is that virtually everyone can serve in some position. All it takes is the heart of a servant, and a love for Christ. Just in the Spring River ministry alone, the jobs run from washing clothes and wiping down showers, to bucking a chainsaw and pulling brush. But it does not end there. There are service opportunities in Mass Care, Child Care, Mud Out, and Chaplains at the State level. But the greatest service of all is talking with the homeowner…and the possibility of planting that one seed that may bring them to a relationship with Christ. This experience will change you forever!